BY THE NUMBERS: Is there a "war on police"? Last week, KXLY ran a story about a couple who followed Spokane County Sheriff's Deputy John McQuitty while he was on patrol during dark, early-morning hours. In an interview with reporter Jeff Humphrey, Sheriff Ozzie Knezovich said the couple's actions were dangerous, "especially in this day and age where, again, you have officers being executed." A recent survey by Rasmussen Reports found that 58 percent of people polled believe there is a war on police today, and it's easy to understand why. In August, a Texas sheriff's deputy was shot in the back while gassing up his patrol car in a Houston suburb. Kentucky State Trooper Joseph Cameron Ponder and Louisiana State Trooper Steven Vincent were shot during traffic stops in the past two months. And two New York City police officers, Wenjian Liu and Rafael Ramos, were shot point-blank while sitting in their patrol car in December. Washington state is no exception. In 2009, a man killed four Lakewood police officers while they met at a coffee shop before their shifts. Indeed, law enforcement is a tough and often ugly job, and some police officers are killed simply because they're police officers. However, a deeper look at data on law enforcement deaths and assaults on police does not support the notion that there is a "war on police." 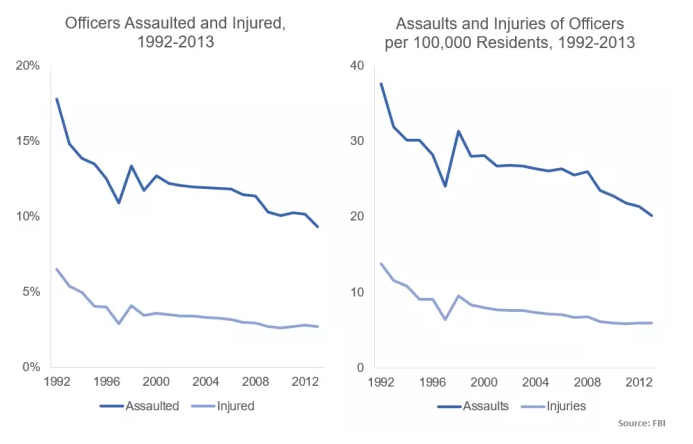 In fact, since the 1970s, policing has become increasingly safer, and perpetuating the idea that police are under attack is dangerous, according to Washington Post blogger Radley Balko. 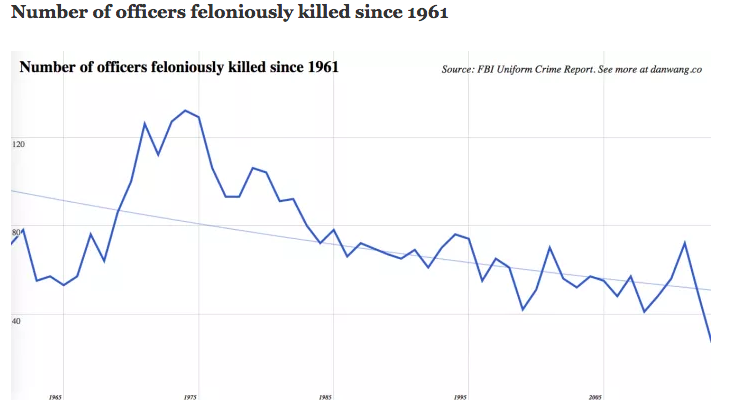 According to Wang's data, "more officers are feloniously killed in the 11 years between 1970 and 1980 (1,228) than in the 21 years between 1993 and 2013 (1,182);" and on average 125 officers were feloniously killed per year between 1971 and '75. That number dropped to 50 for the years 2006-2010. You can also look at Wang's raw data in a Google doc here. 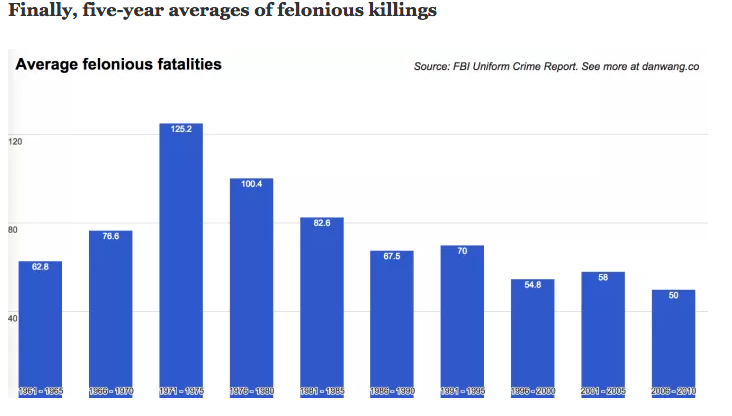 And here's a chart from Seth Stoughton, a University of South Carolina law professor and former police officer, that shows felonious killings since 1970 (in orange) juxtaposed against murders in the general population (in blue). Click here to see data that dates back to 1870. A current police cadet attending an academy in a northern red state wrote an op-ed for The Daily Beast in which he too describes the dangers of the "war on cops" rhetoric, especially in police academies. The cadet, who authored the post under a pseudonym, writes that his instructors blame the Obama administration and the Black Lives Matter movement for inciting violence against police. According to the Officer Down Memorial Page, which tracks law enforcement deaths throughout the country, 89 officers have died so far this year (two in Washington and one in Idaho). The total figure includes accidental deaths, heart attacks, gunfire, vehicle pursuits, assaults and more. So far this year, gunfire deaths are down 26 percent, and overall line of duty deaths are down 4 percent. 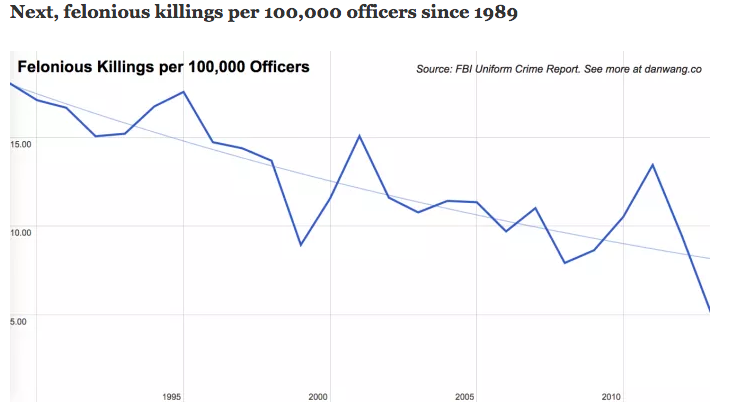 By contrast, law enforcement has killed between 700 and 835 civilians (depending who you ask), a figure that is "almost double the highest number of police shootings ever reported by the FBI for an entire year," the Washington Post reports.